Every closely held restaurant with two or more partners should anticipate and plan for events that could alter the ownership of the restaurant, such as the departure, death, disability, bankruptcy, or divorce of one of the partners. One common way to do this is by implementing buy-sell provisions in the restaurant’s operating agreement if the restaurant is a limited liability company, or in a separate shareholder agreement if the restaurant is a corporation. Simply put, buy-sell provisions set forth the rights and obligations of the partners to buy the shares of another partner when certain events occur. Most partners overlook these types of provisions when forming their restaurant business because they find them uncomfortable to talk about and plan for, especially in the early stages of a business relationship. However, entering into buy-sell provisions at the beginning of your business relationship can save you both money and angst in the long term. It may help to think of buy-sell provisions as a sort of “premarital agreement” between you and your partners setting forth the orderly terms of your “separation” before any hard feelings toward each other start to surface. That being said, if you and your partners did not contemplate buy-sell provisions during the “premarital” stage of your business relationship, you should consider them before you need them. What types of events will trigger a buy-sell? Events that commonly trigger a buy-sell include when (i) a partner who also works for the restaurant retires, voluntarily resigns or is terminated for cause, or (ii) a partner dies or is unable to continue his or her duties due to disability, or (iii) a partner declares bankruptcy or gets divorced and his or her ex-spouse stands to receive an partnership interest in the restaurant, or (iv) a partner wants to sell his or her share of the restaurant to an outside third party. You can include all or any of these events in your buy-sell provisions. Should the buy-sell be mandatory or optional? After deciding which trigger events to include in your buy-sell provisions, partners will need to then decide which events result in a mandatory purchase or an optional purchase at the election of the remaining partners. For example, if the death of a partner triggers a buy-sell right in the other partners and the partners or the restaurant have purchased life insurance policies on the life of the deceased partner, then the purchase of the deceased partner’s share would likely be mandatory upon the death of the partner. Alternatively, if there is no life insurance on the deceased partner’s life, the partners may decide to make the purchase optional at the election of the remaining partners. Click here to read more. David Robinson is an associate of Ruberto, Israel & Weiner and a member of the firm’s Litigation; Hospitality & Retail Services; and Employment Groups. Dave can be reached at dwr@riw.com. Customer complaints or suggestions should always be taken seriously. Some are in fact quite serious e.g., cold food, late food, an item that disagrees with them… foreign object, etc. Some may be more frivolous, but no matter, a diner’s opinions and experiences should always be respected. And in some cases compensated… discount off next meal, take something off the bill, round of drinks etc. Make sure they feel their concerns were heard. So they leave with a good feeling and come back, and as importantly, not spread a negative experience around. RIW congratulates Blue Ox and Matt O’Neil as 2015 Boston Magazine Battle of the Burger Champion. 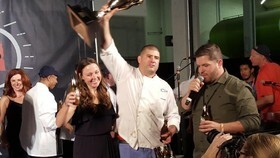 Pictured below is Michael Rosen with Matt O’Neil and Matt celebrating with his wife Joanna. Tavern in the Square Group opened a new mexican-themed restaurant in South Station, Boston called Tavitas/A Mexican Joint, on August 24, 2015. Wahlburgers opened in Lynnfield and will also open in Fenway this month. 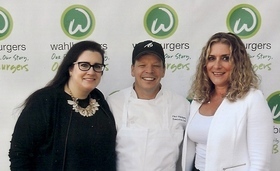 Pictured below are Bethany Grazio and Kelly Caralis with chef Paul Wahlberg at the Lynnfield opening party. Congratulations to PAGE Ventures on the purchase of 26 Dunkin Donuts stores in the Buffalo area. Row 34 opened in Portsmouth New Hampshire on May 24, 2015. Congratulations to Liquid Art House on their one year anniversary. 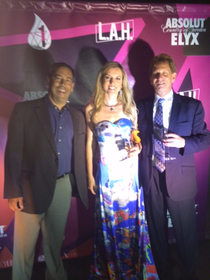 Pictured below is owner, Ruta Laukien with RIW’s Lou Katz and Howie Altholtz. Michael Rosen and David Robinson are speaking at the National Retails Tenants Association Annual Conference on September 27-30, 2015. The event is taking place at the Orlando World Center Marriott in Florida. Details. 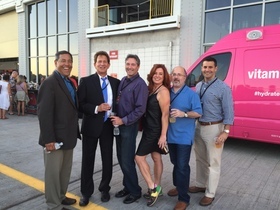 Pictured below are Lou Katz; Howie Altholtz; Chis Litterio; Michael Rosen; and Brad Croft along with Boston magazine Publisher Kristen Standish at the 2015 Boston Magazine Battle of the Burger event which took place on Wednesday, August 12, 2015. Brad Croft moderated a panel BISNOW’s Boston Retail: The Impact of the Ground Floor & What Tenants Want. The event took place on July 29, 2015 at the Westin Boston Waterfront. 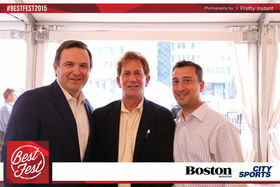 Joe Magner, Howie Altholtz and Chris Agostino are pictured below at Boston magazine’s 2015 Best Fest 2015 event which took place on July 21st at Boston City Hall Plaza. RIW is a sponsor of the Boston magazine 2015 Power of Ideas event. Russ Stein will moderate a hospitality panel. Details to follow.